Should I use immersion oil or water with my microscope objective lens? And why do some objectives require immersion oil or water? The resolving power of an objective lens depends on its numerical aperture, which in turn depends on the refractive index of the medium between the specimen and the objective lens. A higher refractive index means the lens can gather more light and deliver a better image intensity. Air has a relatively low refractive index, and when it is the medium between the specimen and the lens, lower N.A. objectives perform at their best capacity. Higher N.A. objectives need a higher refractive index to operate and immersion oil provides that higher index. For optimum performance, you will also need to oil the top lens of the condenser to the bottom of the specimen slide. Immersion objectives are marked "oil" or "oel". Objectives marked "wi", require water as the immersion contact medium. 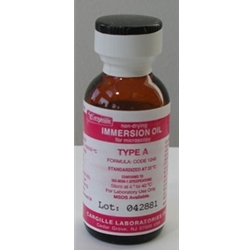 There are two basic types of immersion oil, Type A and Type B. The only difference between the two is the viscosity. Either will work well. One or two drops of oil are placed on top of the cover slip and the 100x objective lens is brought into position so that it touches the oil and creates a "bridge" of oil between the top of the slide and objective lens. The oil has a refractive index very close to that of glass. This allows very little refraction of the light rays as they go through the slide, specimen, cover slip, oil and through the glass objective lens of your microscope.